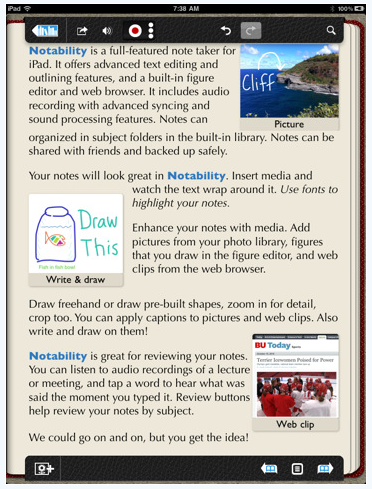 The Notability app remains a simple notes app to use while having enhanced document features like text wrapping pictures. We all have favorited note taking applications on our iPads. Some use ones that keep the handwritten notes in digital ink, others are for typing with heavy cloud storage like Evernote and there is a group that loves their ‘do anything’ document editor. The group of Notability users like how there is enough power to create nice looking notes to share which contain drawn images variety of colors of ink, text in 40 fonts wrapped around images and audio recordings. 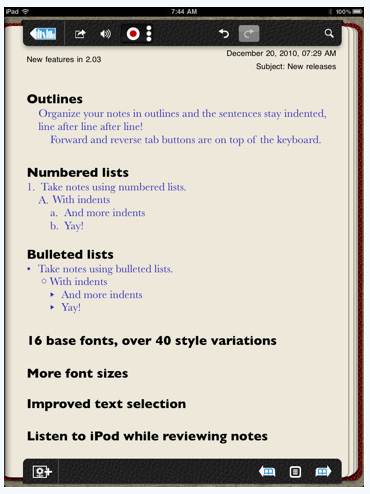 Users are also able to make Outlines, Numbered and Bulleted Lists. A lot of power, without the need of endless buttons and option pull downs. Notes can be divided into ‘subject’ folders that can be named as needed. Two areas that modern iPad notes apps must support to be under our concideration; Sharing and BackUp. Sharing Notability created notes is done via the app’s ability to export the note as a PDF then send as an attachment to an email. It can also export in it’s native format which allows for any audio recorded into the note to go along. Lastly, files can be pulled out via the iTunes sync share. Another level of sharing for Notability is also a second backup away from the one in iTunes. Full integration with DropBox makes it easy to save a backup of all files to the free cloud service, DropBox. By having your notes on DropBox, you can send out a link to a single note to avoid emailing the actual note PDF.